It’s that time of year again when my parents avocado trees are dripping with fruit and the local markets are full of gorgeous avo’s ready for the picking. I’ve been filling my bag with them at the markets, for a very decent price, and I can’t wait for my parents visits when (hopefully) they come with arms full of them. Of course, nothing beats the simple avo on toast combination , and I can’t go past that. But when I have so many I look to other ways of including them in my diet. Smoothies are one of my favourite things and I don’t think a day goes by when I don’t have one. So it’s no wonder that the avo’s have ended up in my smoothies. They are perfect in a vibrant green smoothie, with lots of kale, mint, lemon and cucumber, adding a very welcome creamy texture. Today I mixed it up with a very decadent shake, using the avocado to make the drink extra thick and creamy. This is the perfect breakfast treat or dessert. 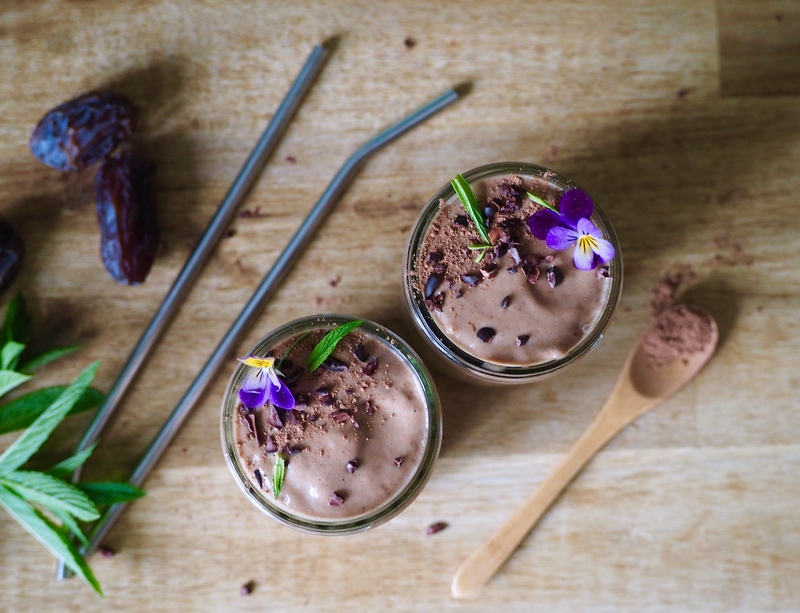 It’s packed with the goodness of raw cacao for that rich chocolate flavour, mesquite adds a lovely hint of caramel and is a good source of calcium & potassium as well as stabilising blood sugar levels and of course the hero avocado is high in vitamin K and healthy monounsaturated fats. 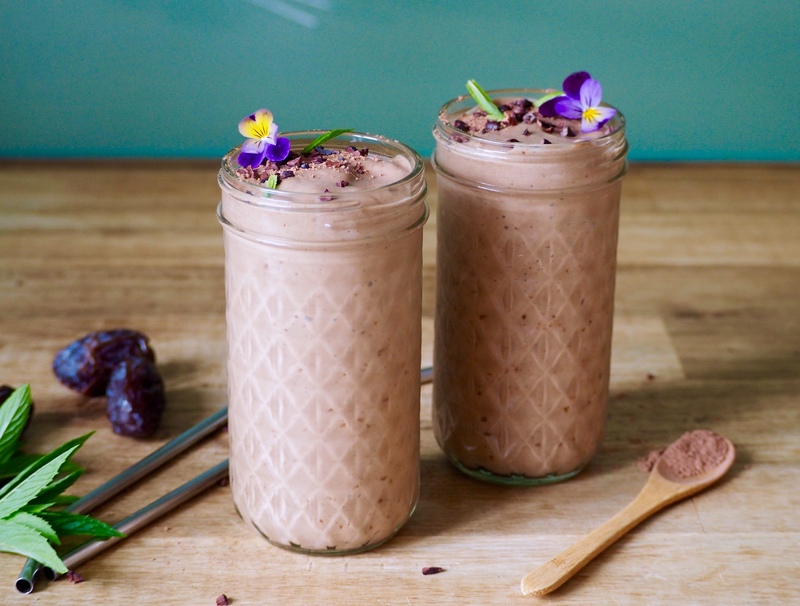 Place the banana, avocado flesh, ice, mint cacao powder, mesquite powder, medjool dates & almond milk into a high speed blender. Blend for 1 minute or until thick & creamy. 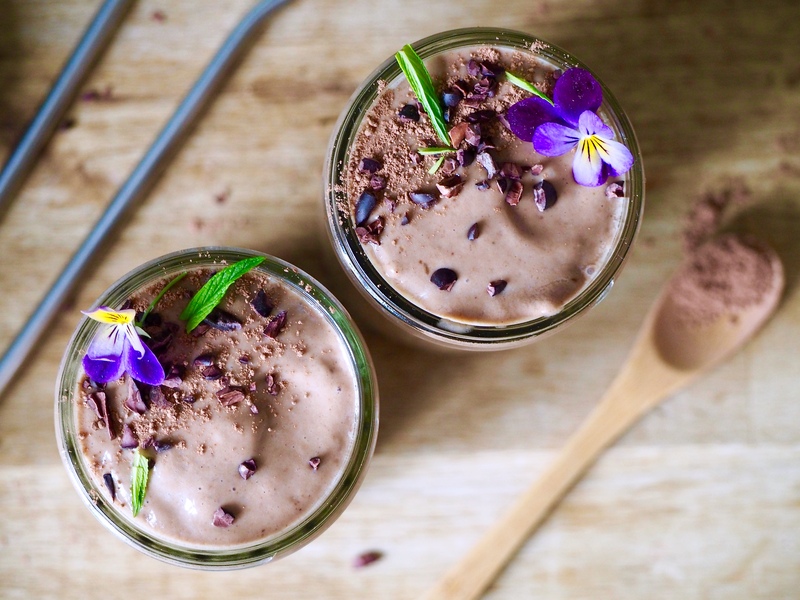 Pour into 2 glasses and top with an extra sprinkle of cacao & a few cacao nibs. Drink immediately.